The Dillon Regiment was first raised by Viscount Dillon in 1688 to fight in Ireland for the Jacobite cause. The regiment transferred to French service 3 years later and formed a brigade with the other "Wild Geese" regiments. 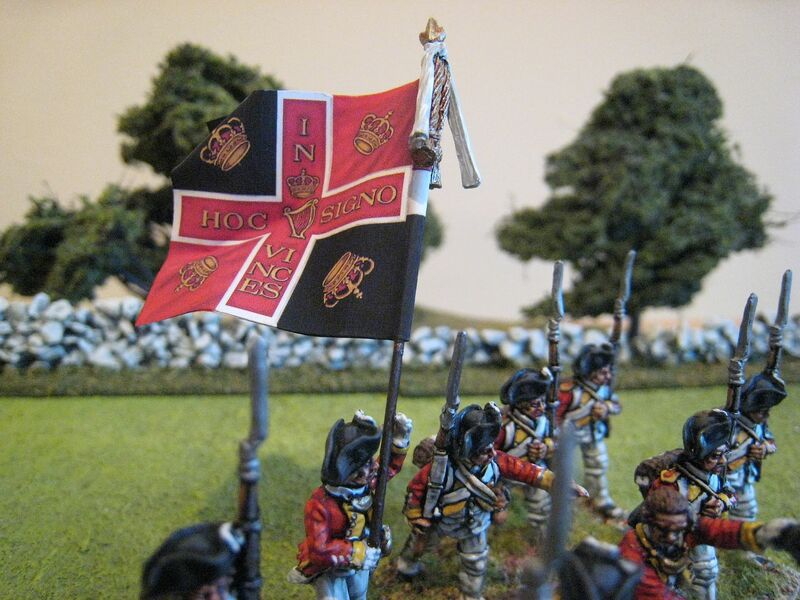 These Irish regiments served at virtually every major land battle fought by the French between 1690 and 1789, perhaps most notably at Fontenoy where they captured the colours of Coldstream Guards. The Dillon merged with two other Irish regiments, de Lally in 1762 and de Bulkeley in 1775. From 1779 to 1782 the regiment was present in the Caribbean and America: it fought at the capture of Grenada in 1779 and then at Savannah later that year. I'll say more about the Dillon's involvement at Savannah in a short while. When King Louis fell to the French Revolution the regiment, which had remained loyal to the king, lost the Dillon name and was absorbed into the French regular line. Apparently the last colonel of the regiment, Arthur Dillon, was guillotined in 1794. Ironically, given the circumstances surrounding the regiment's foundation, the Dillon name lived on in British "emigre" regiments that were raised from the Irish Brigade's former officers. I have always had a soft spot for the Wild Geese. On my father's side I come from Protestant Ulster stock and so these fellows and I would have little in common politically, but they were brave and dashing fighters united by their hatred of the English (or at least that's their image) and one has to admire them for that. Also, the very first Osprey book I owned was the one on the Wild Geese, which I bought about 25 years ago at a bookshop in Belfast. 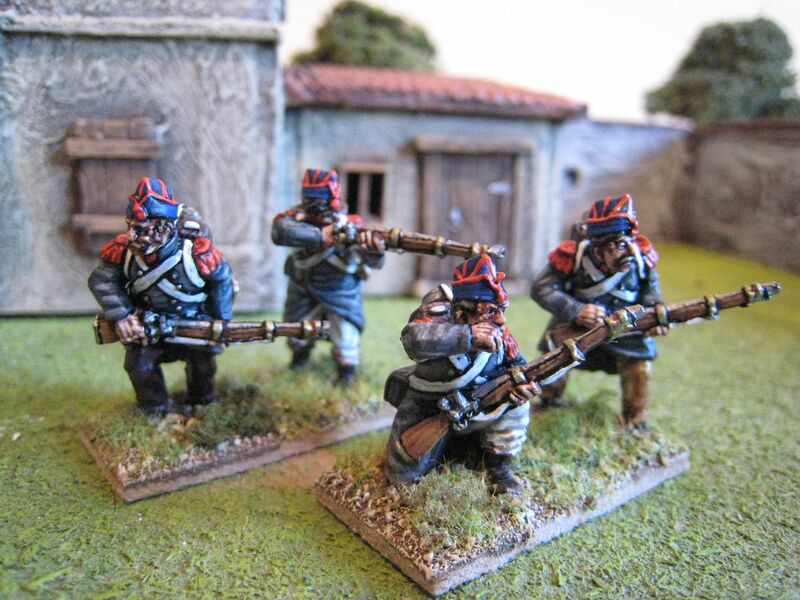 I felt a bit guilty that having praised the Perry Miniature French releases I then painting only one battalion, so I was keen to paint up some more. Happily I'm now stuck-in to the French so expect some more over the next couple of months. 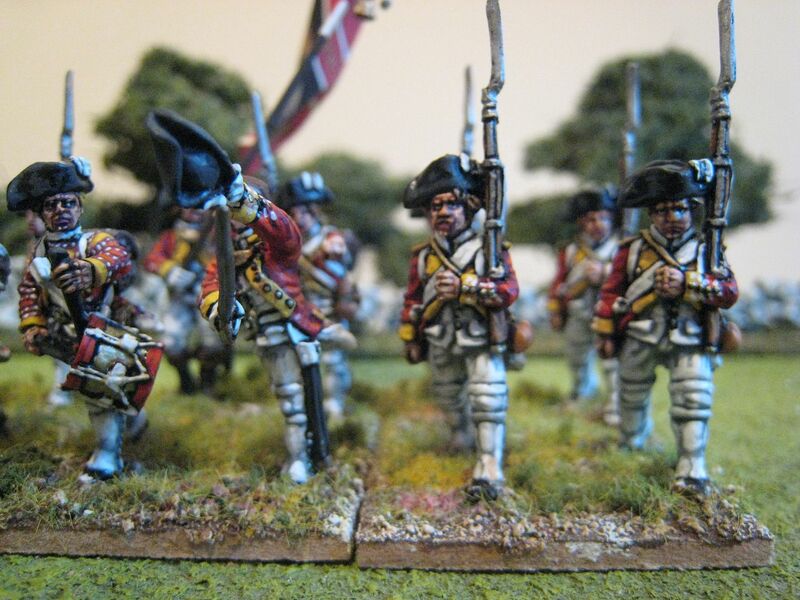 The Dillon only appears once in the published "British Grenadier" scenarios, as a 12-figure unit for Savannah; small, perhaps, but the the chasseur and grenadier companies are detached into combined formations. I opted to go for the 1779 ordonnance uniform, even though it's almost certain that the regiment would have worn the 1776 ordonnance, or a variant of it, for the Savannah campaign. I came to this decision for two reasons. First, I wanted the regiment in march-attack poses, and the Perry figures in 1776 dress are only in standing poses. Secondly, I saw the illustration by Eugene Leliepvre that shows the men in rather longer coats than one would expect for 1776 dress; the 1779 coat is a similar cut to that shown in the picture. That illustration also shows a drummer in the same scarlet coat as the rank-and-file rather than the standard royal livery, a point confirmed by the Chartrand Osprey on French troops in the AWI. 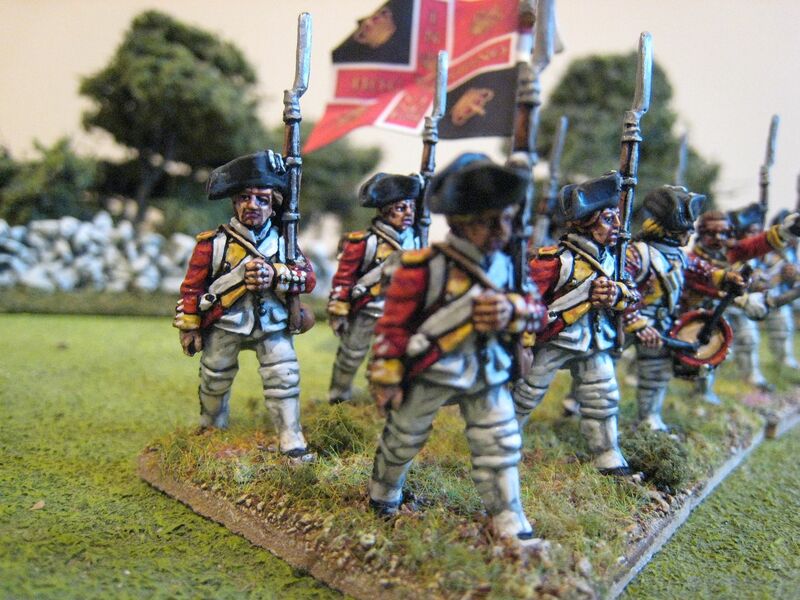 Due to the red coats I undercoated these figures in black rather than mid-grey, but then used the same grey/white combination for the waistcoats, breeches etc as I used on the Armanac Regiment. I also decided to apply the "second battalion" colour rather than the white colonel's first battalion colour, because it's just so much more colourful and the black and red cross is a pretty iconic Wild Geese image. Many thanks to John Ray and "Mericanach" for their advice on and help with the uniform and "look" of this regiment. I think these turned out ok and I really enjoyed painting them. 12 figures. Painted January 2011. Flag by GMB. This is the first battalion of the 61me Ligne for Bachelu's division of 1815. I now just have the 3me Ligne to go and the division is finished! That won't appear on the workbench for a while, though, as I have plenty of AWI and First Carlist War stuff to plough through first. As usual, the figures are mainly Perry plastics, with a handful of metal figures (the officer, NCO, drummer amd kneeling skirmiser, plus one or two others in the ranks). Also as usual, the Perry plastic infantry were a dream to paint. Most of the front row have utilised the extra heads that appear in the box. I've realised that there are only 2 or 3 of those additional heads that sport moustaches, and so the flank companies have less "head variety" than the fusiliers ones as it seems wrong to have grenadiers without moustaches. I painted half the battalion in August and finished it off over Christmas. The building is a farmhouse made for me by Paul at Touching History, to go with the two barns I bought a while ago. It's a very nice model with some walling (I believe made by Hovels) to finish things off. As noted before, a GMB flag does not fit on the eagle as supplied with the Perry plastic set so I had to extend the eagle a bit (hiding the join within the flag). As I've said before, there is something I find very satisfying about painting these figures, so it won't be long before I paint the 3me Ligne. Next up: lots more AWI. 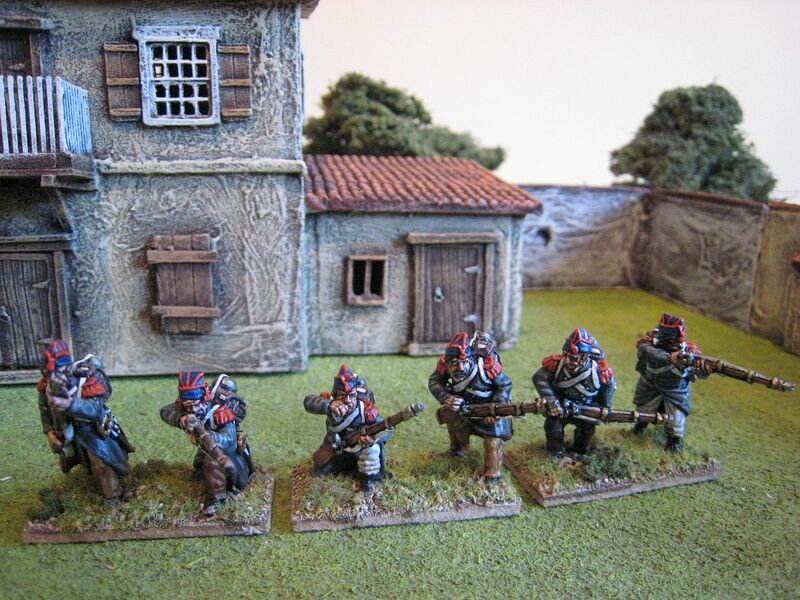 Currently on the painting table: AWI French bombadiers de marine and First Carlist War Isabelino light infantry. 28 figures. Painted August and December 2010. Flag by GMB. 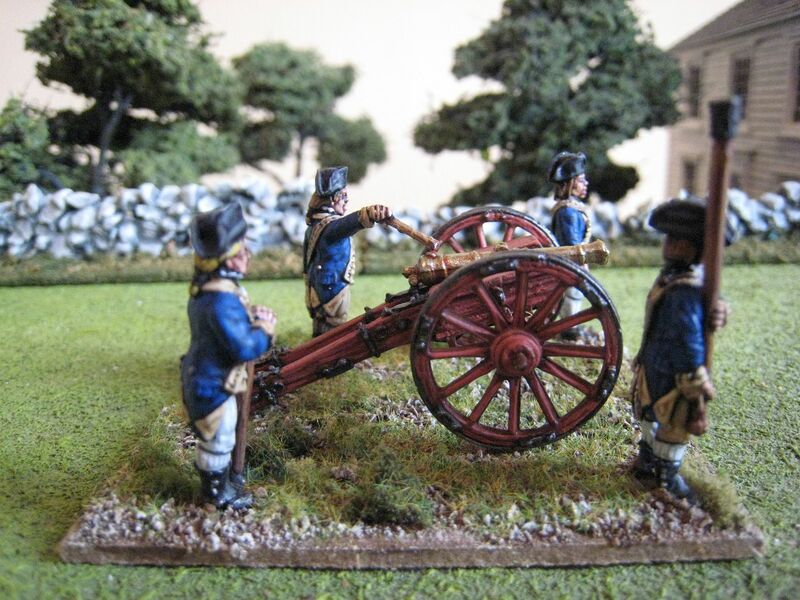 Here is the second Foundry Continental 6-pounder that I recently finished, together with a small American artillery command stand. 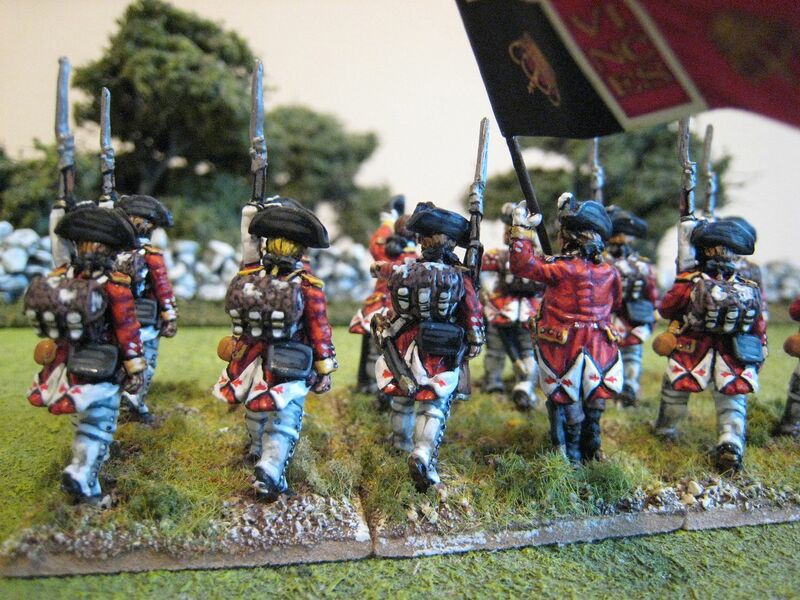 I put this crew in the standard blue faced red coats, but gave a couple of them non-regulation breeches to suggest a bit of campaign wear and tear. The command vignette was inspired by Bernard Cornwell's latest novel "The Fort", which describes the Penobscot Campaign of 1779. Various historical characters do not come out of the novel particularly well, one such being Paul Revere who commanded the American expedition's artillery. Revere as painted by Cornwell is disobedient and unhelpful, more concerned with having a good breakfast than obeying orders. 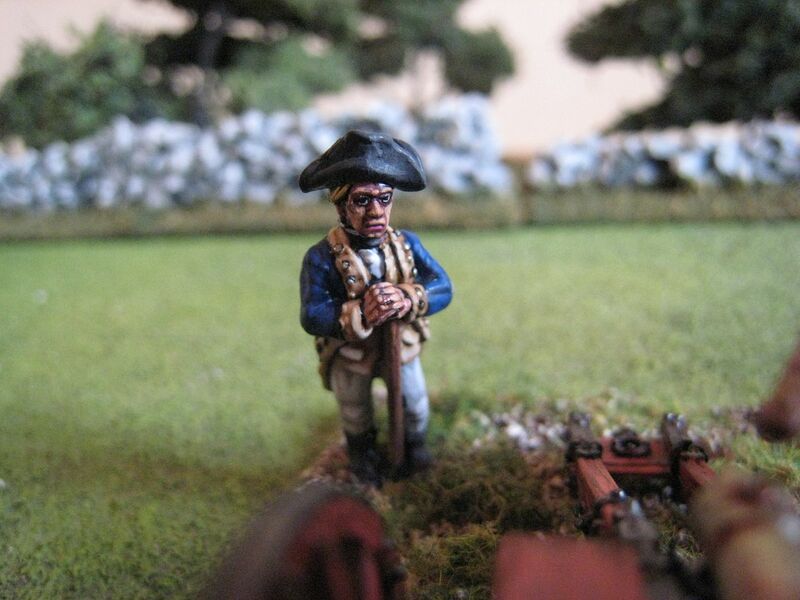 The situation envisaged in this vignette is that an infantry corporal has been despatched to discover why his battalion is not receiving the artillery support it needs. "Sir, you are supposed to be assisting us and we have been forced to move to a new position over there!" 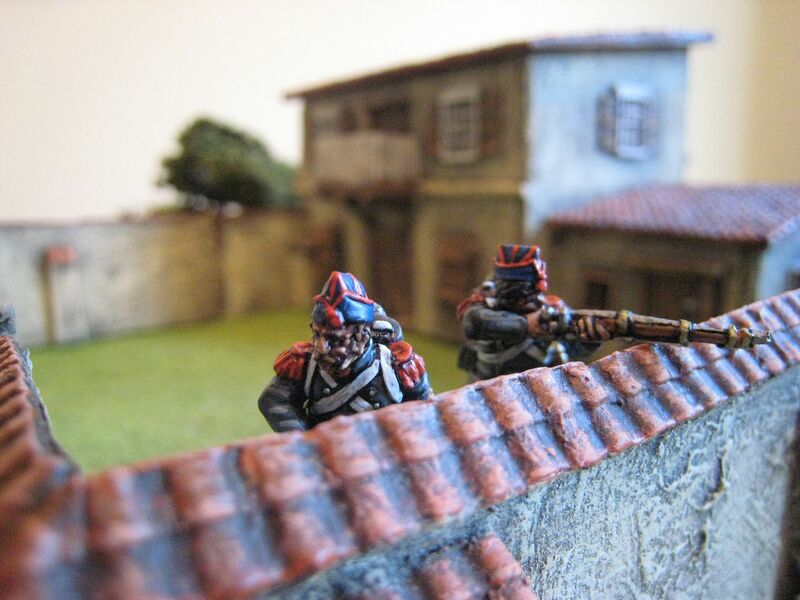 "Corporal, my orders are to fire in the opposite direction and so that is what I intend to do. Good-day!" I painted the corporal (as evidenced by the green epaulette) in a brown faced buff coat to contrast with the artillery officer's blue and red. 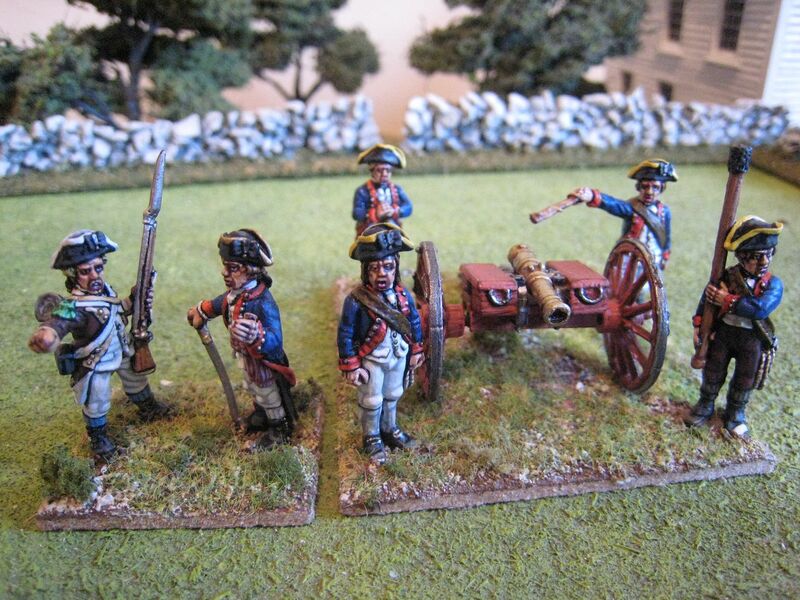 I thought I'd jump ahead in my painting chronology to give the blog a short rest from AWI artillery. 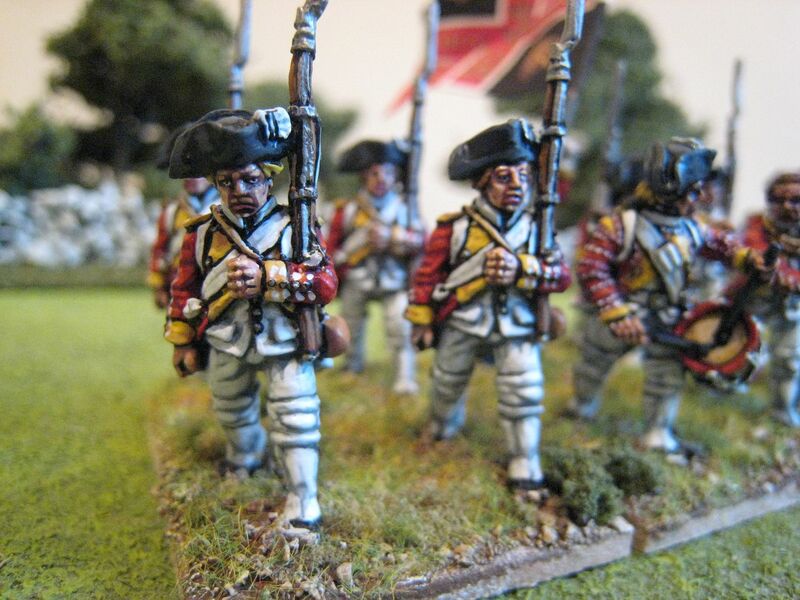 This is one of the two Perry Miniatures packs of skimishing Isabelino flank company infantry. 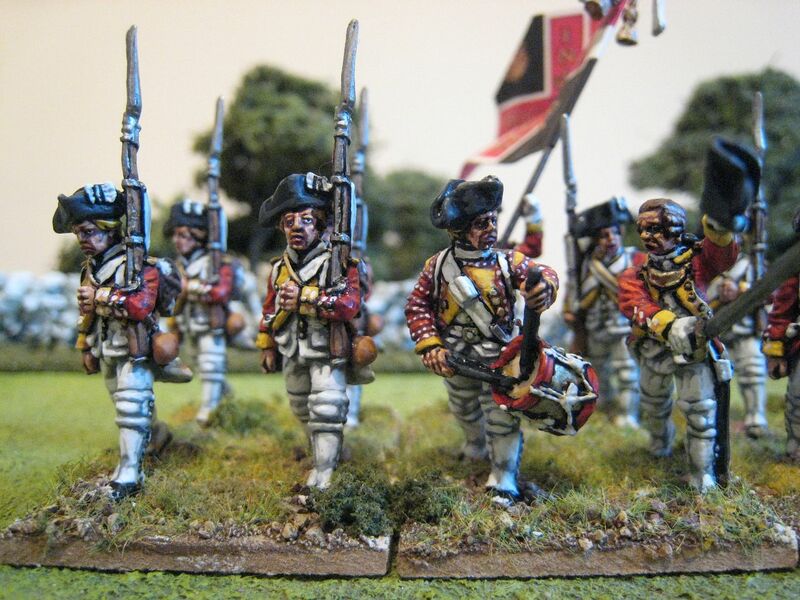 I have painted all these as grenadiers, rather than a mix of grenadiers and cazadores. I haven't really given much thought to how my First Carlist War battalions will operate under whichever rules I end up using (current thoughts are the General de Brigade variant "There are your guns"), but I'm assuming plenty of skirmishers will be needed. It is clear from my reading on the war that both sides made extensive use of troops in skirmish and open order, partly as a result of the difficult terrain in the north of Spain. So I'll probably be painting quite a few more skirmishers in the fullness of time. I admit to finding the faces on these figures quite difficult to paint, particularly the eyes (hence the lack of close-ups! ), but I like the figures and their sense of movement. 6 figures. Painted January 2011. When I started this blog in January 2007 I had no idea how long it would last, and so I would like to thank all those who read, follow and comment on this blog as the interest you show is very much appreciated. I can't really do a "review of the year" post as I haven't done much this year apart from painting figures. I only managed one show and one game (pathetic, I know), but then I realised a long time ago that the parts of the hobby that I enjoy most are painting and collecting figures and then discussing the hobby with like-minded people. Like many others, I suspect, the lack of a permanent gaming table is one reason why I don't actually game much (and the lack of any club affiliation is another). 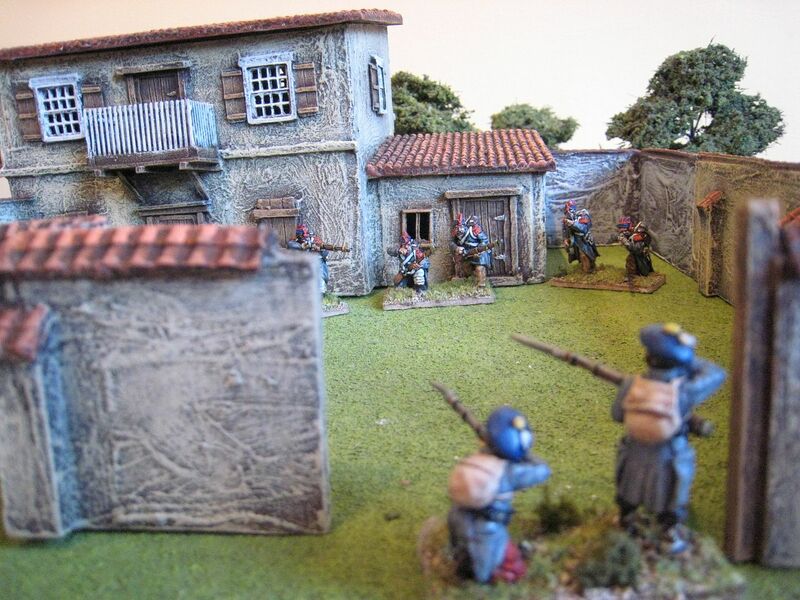 But I assume that will be remedied at some stage in the future and consequently I haven't stopped buying up pieces of terrain this year - some lovely buildings from Paul Darnell for my First Carlist War, Sudan and 1815 projects and the two Tablescape buildings for the AWI. I have not succumbed to any "shiny-itis" impulse buys this year, apart from a few packs from the North Star colonial Africa range. 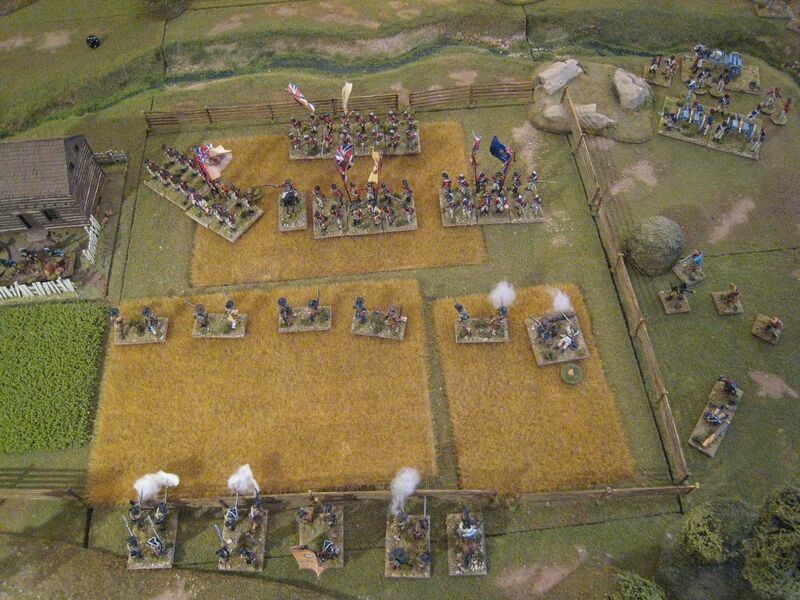 I bought the Perry plastic Napoleonic French hussars box at Salute and still have not decided what to do with them. An early idea was to paint a few as Diemar's Black Hussars for the AWI, but having researched the uniform I don't think these figures will work (unless I concoct something that is half plastic hussar and half Queen's Rangers hussar); so I may just paint them up for 1815. - First Crusade: 7 foot and 1 cavalry. That makes 340 pieces or "points" (i.e. counting cavalry as 2), which is a significant, albeit expected, reduction on last year's production of 524 points. Still, a weekly average of 7.8 figures isn't that bad. 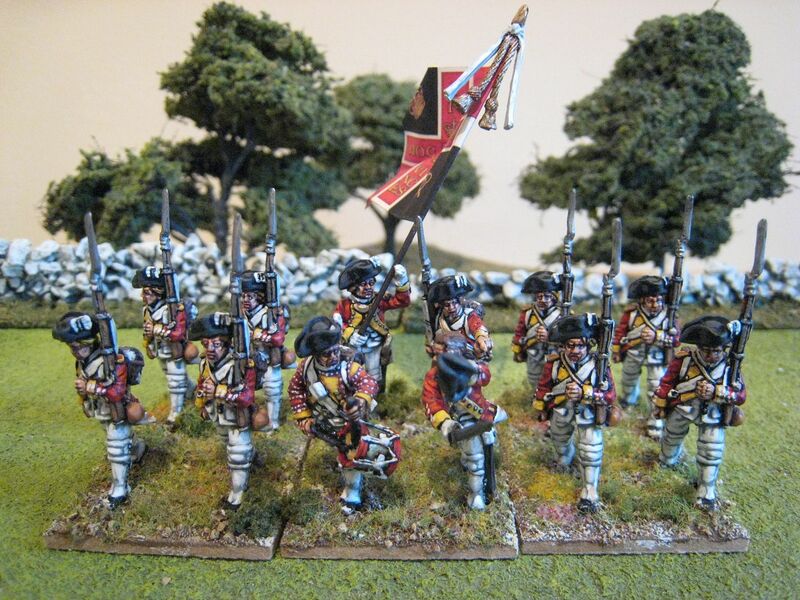 Looking at the figures I am surprised at how few Carlist War figures I painted - that was the AWI's gain but I will need to spend more time on the former period this year. I am still unsure where the ECW, First Crusade, Sudan and Darkest Africa projects are going. I suspect for each of those periods it will be a question of painting something up as and when the mood grabs me. I should make an effort to at least finish off the Crusades units I have half-finished and some ECW command stands. For 1815 I had intended to continue to paint at least one brigade of infantry a year, but I can see that target slipping. So instead I will just paint the 3me Ligne, which will then finish off Bachelu's division. After that I will paint up the remaining brigade and divisional command stands and then work on some foot artillery. 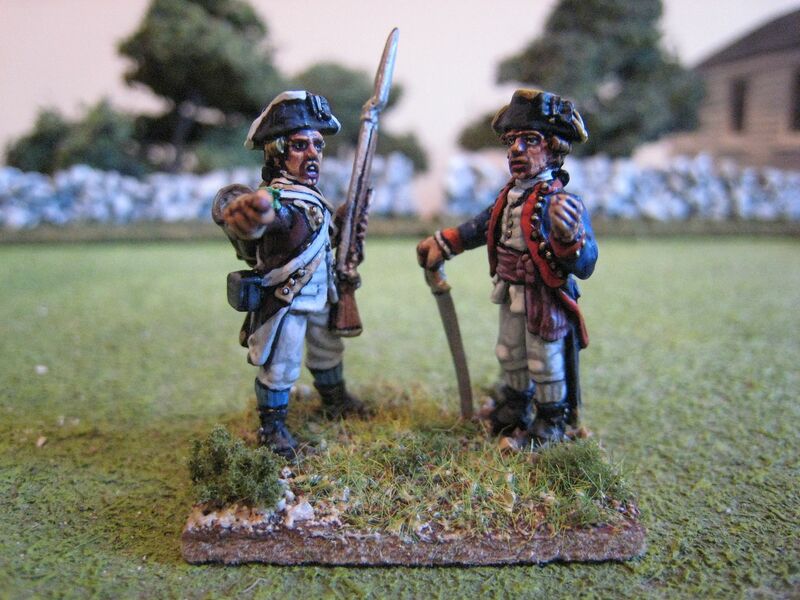 The AWI this year will see more French, British infantry battalions, British Legion cavalry and hopefully some American militia cavalry if Eureka make/release them. In the First Carlist War leadpile are line battalions for both sides, the French Foreign Legion and British lancers. All that depends of course on finding painting time, and I fear that will be squeezed further this year. The Kiwi is determined to move house by the end of the year and as that will mean moving out of central London (we have no idea where to) I will have to start serious commuting to work. Whilst that won't impact much on morning painting time (because that vanished when Hugo was born), it will on my current evening painting hour of 7.30-8.30pm. Putting the house on the market may also necessitate packing my painting stuff away completely. Ho hum. I hope readers had a good Christmas break. My brother worked out yesterday that over the past 2 weeks he had drunk 35 different wines, and I suspect my tally was similar. Personal wine highlights included: Chateaux Calon-Segur 96, Leoville-Barton 95 and d'Yquem 97 on Christmas Day; Puriri Hills "The Pope" 2005, Hugel Alsace Pinot Gris 1989 and Graham's 1977 port on Boxing Day; Jeanneret Clare Valley Riesling 2003 and Pol Roger 1999 on New Year's Eve; Greywacke Sauvignon Blanc 2009 and d'Arenberg "The Sticks and Stones" 2002 on New Year's Day; and Bollinger Grand Annee 2000 throughout the festive period. Hic. 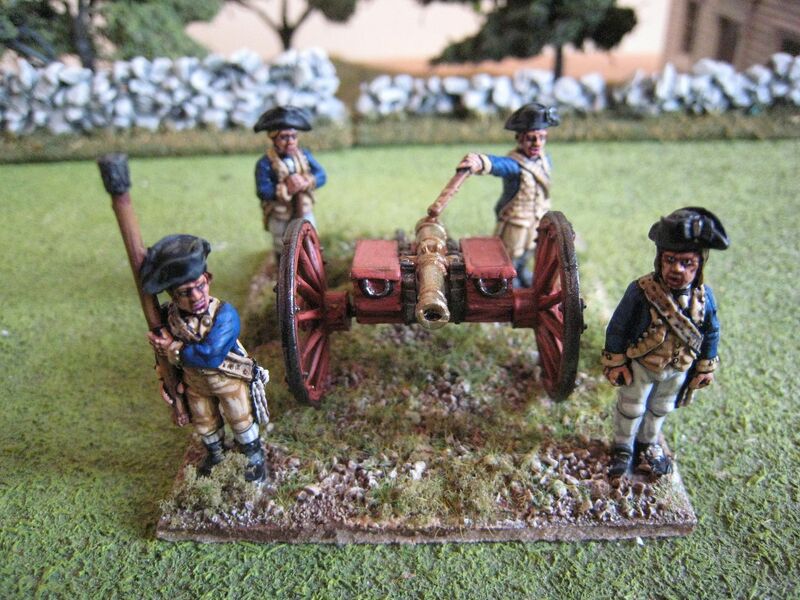 Next up: more British line and American artillery for the AWI, Isabellino skirmishers and the 61me Ligne. The photo above is of Eclaireur's and my recent refight of Freeman's Farm - more on that anon. I would normally post artillery crews in pairs but the companion to this piece is the same Foundry pack so I'll post that in a few days with an artillery command vignette. 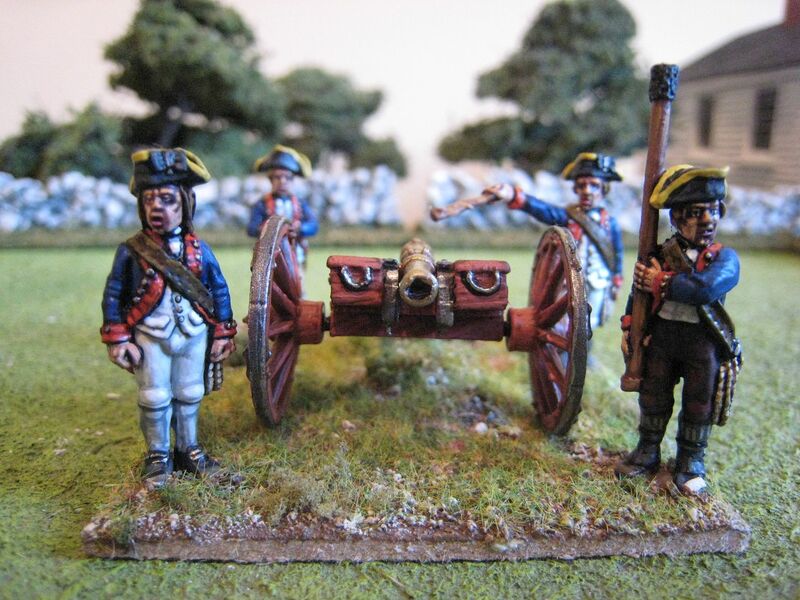 I have had two of these packs in the lead pile for a good few years and in fact it was these packs that prompted me to spend a bit of time focusing on artillery for both sides. 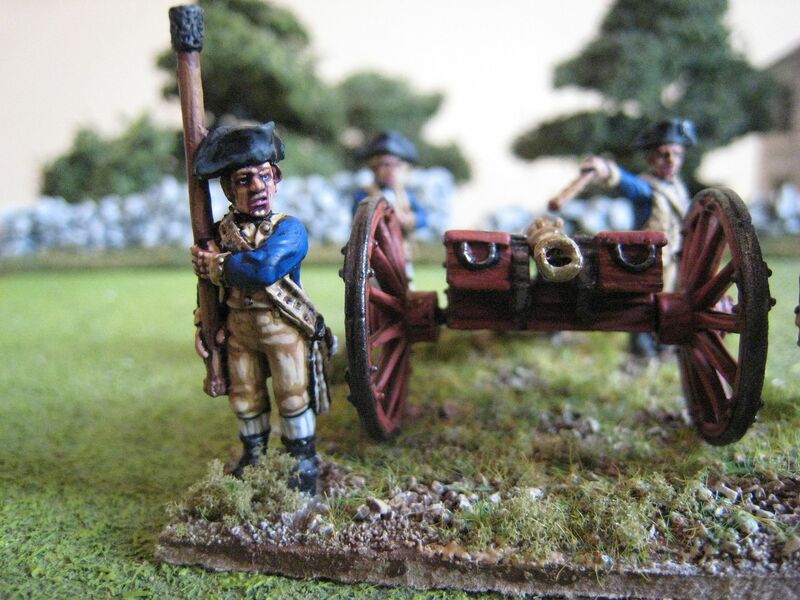 I already have 2 or 3 of this firing crew in my collection so decided to paint one of the new packs in the buff facings of Lamb's New York company of 1775. I appreciate that this uniform is not really "correct" for anything outside of the invasion of Canada (during which campaign Lamb's company was all but wiped out), but it makes a nice change from blue coats with red facings. I painted the gun in a completely different way. All my other American guns are in a natural wood colour. For the 4 new American guns I am working on I decided to paint the guns themselves in the reddish-brown colour that I have read about on TMP and other fora. Apparently Continental gun carriages were sometimes painted in a red oxide colour, which was also commonly used on farm and other buildings - see the picture of the Neilson House on the Saratoga battlefield here. 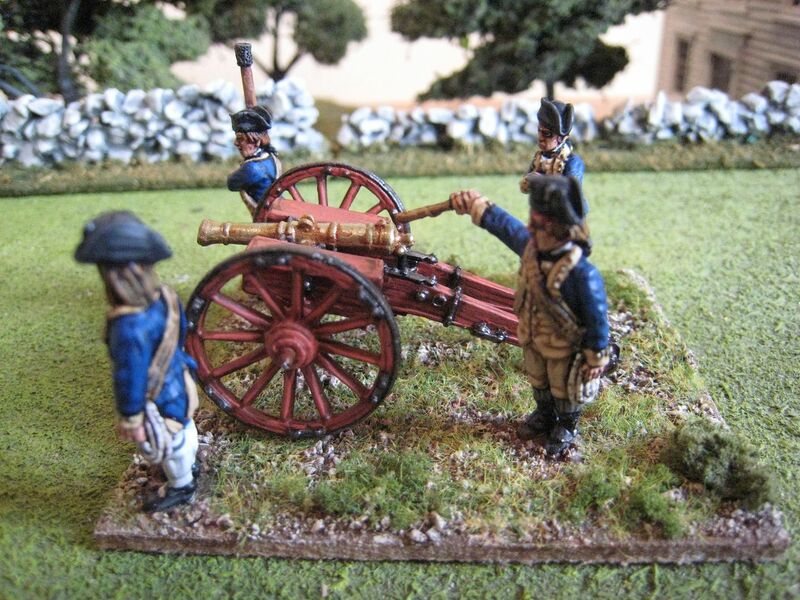 For the gun carriage I used the Foundry "Terracotta" palette and then "Blackened Barrel" for the metal work. 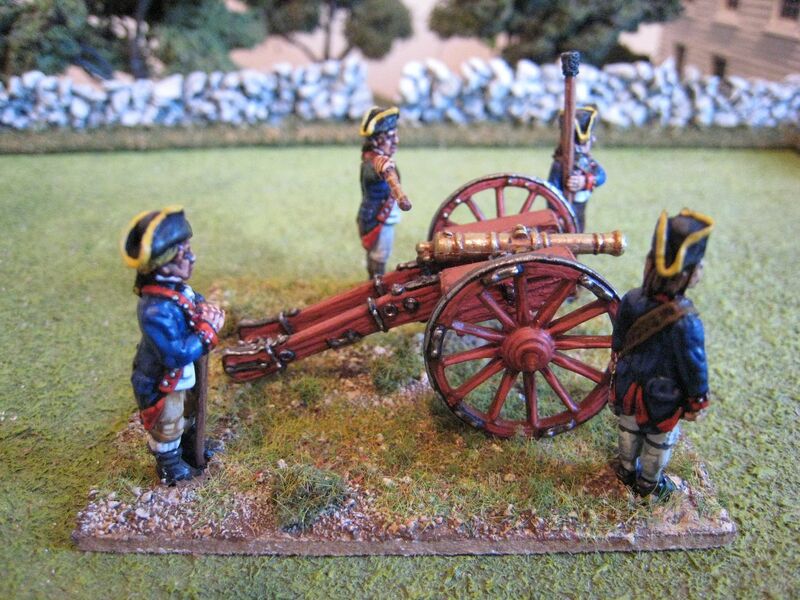 The buff facings on the artillerymen were painted with the Foundry "Buff" palette with a final highlight of Coat d'Arms "Bone". 4 figures. Painted December 2010.